Western Products launched a new pre-wet system for Striker stainless steel and Tornado poly hopper spreaders. Each system features a corrosion-resistant protected enclosure for pump, electronics and valves and is available with 25- and 50-gallon poly tank capacities for Striker models and 25-gallon poly tank capacities for Tornado models. 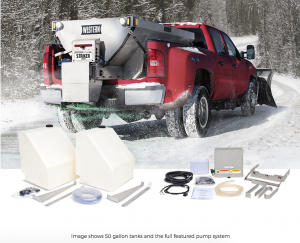 The pre-wet system for both Striker and Tornado hopper spreaders also features Fleet Flex technology, a universal wiring and controls system for interchanges between electric hopper spreaders. Each control includes a pre-wet accessory button, and the flow rate is set manually using the valve in the pump housing. For operators who want additional flow control from inside the cab, a separate in-cab control option is available, featuring a flow control dial and warning lights that alert the operator of a clog or if the tanks are empty.